In April of 2016, the FDA approved a corneal cross-linking system to treat keratoconus for the first time. Rather than using corneal implants, cross-linking (or CXL) allows you to strengthen your cornea naturally and prevent the thinning and distortion that keratoconus frequently causes. It can be used to stop the deterioration of your cornea, and may even help it gain strength. Foulkes Vision offers you the chance to try this cutting-edge, minimally invasive treatment for yourself. If you suffer from keratoconus and want to resolve the issue without a corneal transplant or implant, set up an appointment at our Chicago offices by calling 630-724-1400. Keratoconus weakens the tissue holding your cornea together. Over time, this leads to bulges and distortions in the surface of your cornea, which in turn creates distortions in what you see. 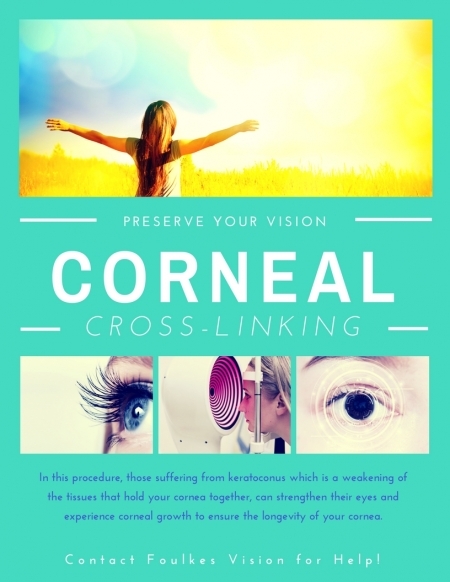 Corneal cross-linking involves applying riboflavin to your eye, which strengthens the collagen fibers in your cornea and prevents your vision from deteriorating further. In a preliminary exam, your doctor will measure your corneal thickness. During the procedure, you will be placed in a reclining position. The epithelium may be removed at this point. One of our trained technicians will apply riboflavin drops to your eye. An ultraviolet light will shine on your eye for 30 minutes. Afterwards, you will receive eyedrops and after-care instructions. A stronger cornea will allow your eye to focus more easily, and may even have the chance to improve your vision. If you would like to have both eyes treated at the same time, or want to combine CXL with another procedure like a corneal implant, speak to Dr. Foulkes during your consultation. 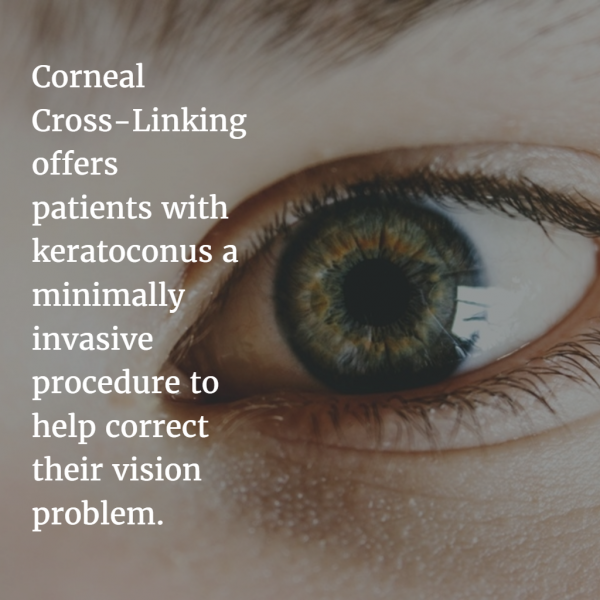 Unlike other keratoconus treatments, corneal cross-linking is largely preventative in nature. The goal of the procedure is to halt corneal deterioration in its earliest stages. Depending on the extent of your cornea’s deterioration, you may not to be an ideal candidate for the procedure. Dr. Foulkes can determine your candidacy at the initial consultation. Corneal cross-linking is still considered an investigative procedure, which means it is not currently covered by insurance. There are some costs associated with the CXL treatment, including tests before and after the procedure. Check our financing options for easy and convenient ways to pay for your CXL. If you think CXL may be the right treatment for you, or want to find out whether you are suffering from keratoconus, you can set up an appointment with Foulkes Vision today. Regular eye checkups are the best way to catch ophthalmological issues before they begin to endanger your eyesight. To schedule your consultation with Foulkes Vision today, contact us by filling out a form on this web page, or by calling 630-724-1400. We serve patients in Chicago, Lombard, and the surrounding communities.